Blue cheese and liver? Yeah, it sounded weird to me, too. But after trying a pheasant-and-duck version of this warm, meaty condiment spooned on toast and topped with a shaving of rich, sweet-salty blue in a wine bar in Florence, I knew I had to re-create it using chicken thighs and livers—much cheaper and easier to find than duck. This remarkable combination is “meatier” in texture from the typical liver-mousse-under-aspic beloved at the holidays. The key is to serve the “pâté” warm, so its rich juices soak into the crunchy toast. If making in advance, add a few tablespoons of water to the pan when reheating to loosen it up a bit. Make roasted chicken thighs for dinner the night before and set one aside as a shortcut. You can find local chicken livers frozen at many farm stands and markets, like Pete and Jen’s at Codman Community Farm in Lincoln. Mince meat and skin of chicken thigh finely and set aside. Heat butter in a skillet, add onion, garlic, anchovies, capers and herbs; cook until the onion is barely browned. Season livers with salt and pepper and add to the pan; they may spatter if not well dried. Cook in an even layer until livers are lightly browned on both sides but still pink inside, then add wine and vin santo or sherry. Cook on high to reduce liquid 1–2 minutes, then remove livers to a board and coarsely chop. Return chopped liver to the onion mixture along with the chopped thigh meat, broth or water and balsamic vinegar; simmer to reduce excess liquid but keep the consistency loose, taste for seasoning and add salt if needed. 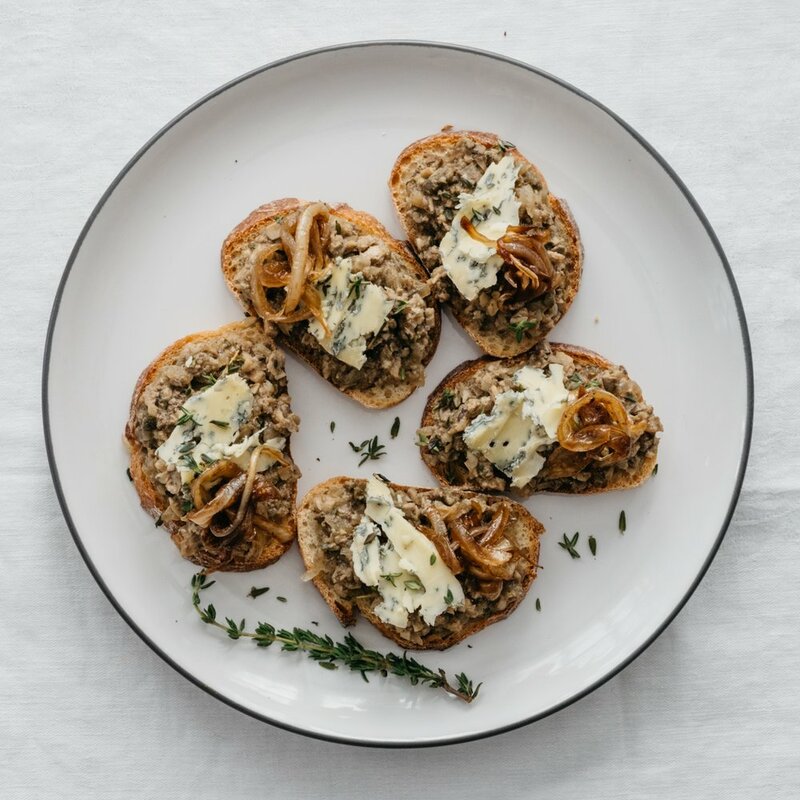 Serve warm, spooned over toasted crostini, topped with thin slices of local blue cheese if you wish, some caramelized onions and fresh thyme for garnish.